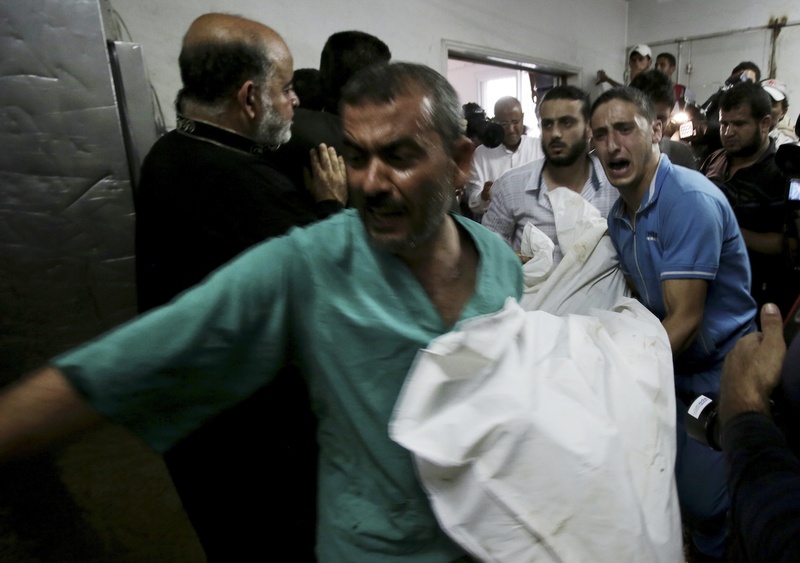 Gaza City, Gaza Strip—Shifa Hospital is again a scene of chaos. Wails of grief and shouts of anger fill the halls. People crouch on the floor staring out with bloodshot eyes; others rush by with bloodied clothes. Stretchers are wheeled back and forth, nearly all of them with bandaged children lying on top, eyes wide with fright or shock. Men and women weep, their hands on their mouths as they try to hold back the grief pouring out. Nearly all the eyewitnesses say the same thing: children were playing on the street in the Al-Shati (Beach) refugee camp north of Gaza City. They scurried between a swing set on the sidewalk and a small grocery shop selling sweets and chips. At around 4:30 pm there was a loud explosion. Then many of the children lay still, some of them in pieces. “I saw a massacre,” says Khaled al-Sirhi. The 22-year-old was sitting in the street with friends when the attack happened. “There were heads off bodies, shoulders half torn, hands gone, chests opened.” There is blood on al-Sirhi’s shirt and hands. Al-Sirhi carried two of the wounded to ambulances, his niece and a boy who died by the time he arrived at hospital. “There were no militants, no resistance members, just children,” he says. Ten people were killed in the attack, including eight children, and forty were injured, thirty-two of them children, according to Gaza’s Health Ministry. Israel claimed a misfired militant rocket caused the carnage, but several eyewitnesses blamed the explosion on an airstrike. More than 1,000 Palestinians have been killed in the nearly three-week-long conflict, the vast majority of them civilians, including over 200 children. Over 6,400 have been injured. At the site of the Shati Camp attack, children’s sandals lie on the street next to pools of blood. Water gushes out of a broken pipe, turning red as it flows down the street. Leaves, blown off the trees by the force of the blast, blanket the ground. Shrapnel holes are everywhere, tearing holes in walls and cars. Young men gather in clusters. The sound of an outgoing rocket hisses out, its trail visible high in the sky. Chants of “Allah Akbar” echo in the street. “We were playing on the swings and the missile hit and everyone started running,” says 6-year-old Anas Abu Shaafa. Two of his brothers were wounded in the attack, and two cousins were killed. One of the two adults who died was Sobhi al-Helw, a 63-year-old grandfather. He had moved his family to Shati Camp from Shejaiya after their house was bombed on July 20 during Israel’s brutal assault on the neighborhood east of Gaza City. His 78-year-old mother, Hijazeya, was killed then and the family displaced. Sobhi had gone downstairs to buy some food from the grocery shop when the airstrike happened, according to his son, Mohamed. His head was almost completely separated from his body. At the hospital, a young relative peers under the white shroud to view the corpse. Upon seeing it, he turns in a rage and pounds the wall with his fist. The attack came on the first day of Eid al-Fitr, the Muslim holiday that marks the end of Ramadan. It followed several sets of humanitarian cease-fires between Israel and Hamas that began with a twelve-hour truce on Saturday, the first halt to hostilities since Israel launched its ground invasion on July 17. While Israeli tanks and troops remained inside Gaza’s borders and sporadic shelling and airstrikes continued, the violence had wound down over the weekend. On Omar al-Mukhtar street, families gathered in the grassy median on Monday morning to try to take advantage of the uneasy truce. Yet this year’s Eid—usually a time of celebration—was more a time of mourning and despair. “How can we celebrate when all this blood has been spilled, all these houses destroyed all these people on the streets with no shelter?” says Ghada Hellis, a mother of ten who is surrounded by a gaggle of children. Her family is among tens of thousands displaced from Shejaiya. They now live in an unfinished building in Gaza City. They have no relatives to stay with, all have had to evacuate as well. The relative calm was shattered on Monday afternoon with the attack on the Shati Camp and news of a cross-border raid by Palestinian fighters. The Israeli army also said five of its soldiers were killed in two separate incidents. Israeli Prime Minister Benjamin Netanyahu warned of a protracted military operation in a televised address Monday evening. “There is no war more just than this,” he said, adding that Israeli troops would not leave Gaza until they had destroyed Hamas’ tunnel network. Gazans began receiving calls late Monday with recorded messages from the Israeli military warning the residents of Beit Lahia, Beit Hanoun and east Jabaliya to evacuate their homes. Continuous deep booms filled the night sky as the bombs once again fell heavily on Gaza.